Singapore Freebies: A'Famosa Resort: Free 3,000 Water Theme Park Tickets Giveaway!! 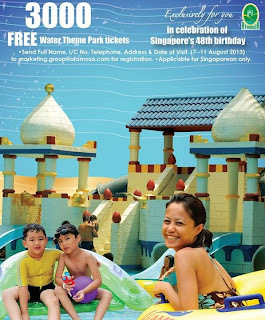 A'Famosa Resort: Free 3,000 Water Theme Park Tickets Giveaway!! Visible from the North-South Highway, A’Famosa Resort is a short distance away from the historical town of Melaka. It is just a mere an hour drive from Kuala Lumpur International Airport and one and half hour drive from Kuala Lumpur. The resort is a one-stop venue for business and pleasure, it boasts an international championship golf course, designed by renowned Australia golf course architect Ross C. Watson, the Water World Theme Park, Animal World Safari, Cowboy Town, Resort Hotel, Condotel and Villas.